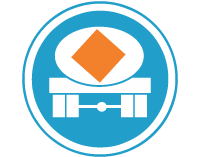 VEHICLES TRANSPORTING DANGEROUS SUBSTANCES ONLY. Where: In areas where there is mining and industrial activities taking place. Action: The driver of a vehicle conveying dangerous goods shall only use such road or portion of such road.